Attic antennas can work better than you might think, some of mine work as well as their outside counterparts (no I'm not comparing to a 150ft tower & big yagis). The RF losses are fairly low in wood and most roofing at HF & VHF, most of problem comes from interaction with electrical wiring and ductwork. This creates deformation of patterns and sometimes high swr. Another concern is to keep your power at reasonable levels, RF exposure to your family and even fire are considerations. I would suggest no more than 100 watts on HF and 50 at VHF & UHF. Be careful to insulate your wires especially at the ends for fire safety. A good tuner will straighten out "impossible" interaction problems on HF antennas, also they will provide multi-band operation on some installations. Though lossy, a tuner can make the difference between acceptable operation or frustration. 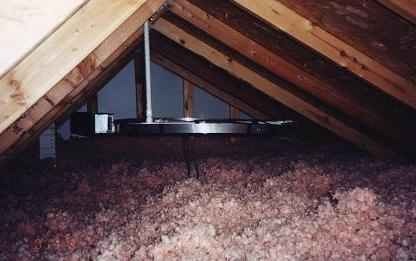 If you are lucky enough to have a large attic take advantage of this and lay out a extensive radial system, this is one area that you can do better than an outside installation also the better the radial system the less RF in your house. If you have a small attic do the best you can, don't be afraid to bend to fit. Almost any size wire will work since mechanical strength is not a consideration. Cut your radials to the 1/4 wave length for your band(s). Radiator(s): On VHF & UHF full size and radiators with gain should be no problem, but on HF usually shortened or loaded radiators are your only choice. Use the longest radiator you can get away with that is at least a few inches away from the roof. It's OK to fold over the top is you have to. If you can, add some tubing on top to turn it into a T for best pattern. Shortened 11m for 10m or Hamsticks for other bands work well. Also several radiators can be installed on one mount for multi-band operation with matching radials, but this does not always work because of interaction between the bands. Coax: Use a good quality coax cable to reduce RF & interaction problems. 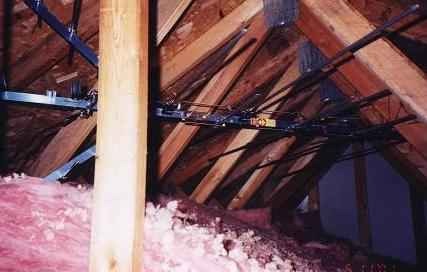 There are a lot of dipoles in attics out there, the big limiting factor here is the size of your attic. If you need more room consider zig zaging your wire, just keep your turns at 90 degrees or more. Also commercial multiband or shortened dipoles work well. Again run your dipole as far away from metal as possible. Try not to have your rig right below your antenna to reduce any potential RF problems. Feed line: A little care is needed here, be careful of running parallel to electrical lines or ductwork if using balanced lines. Use the best coax or twin lead you can but if you can use 300 TV lead with some loss for easy routing. 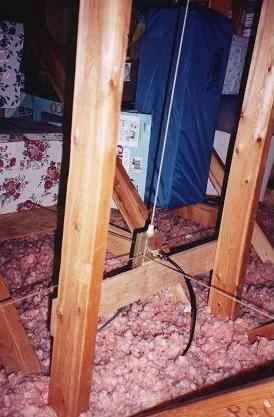 On VHF a beam antenna can work well in the attic, even a rotator can be used. Again stay away from metal and wires to maintain your pattern. On HF wire beams can be run on the roof supports or the rafters, these usually are good for one direction only but can be switched electrically for different coverage.